Luxury family friendly Scandinavian style apartment in the prestigious and luxurious complex of Reserva Del Higueron. Close to beach, shops, amenities and restaurants & Benalmadena. Please Note: minimum stay required is one week. Arrival time is 14:00 and departure time is 10:00 (flexible if possible) to allow sufficient time to prepare the apartment for the next guests. Energy consumption is subject to a fair usage policy. Weekly rate has 50 Euros usage incl. Higher consumption than that will be extra. Security deposit is refundable within 28 days of the departure date, after a thorough check of the property has been conducted and electricity bill received. When vacating guests are requested to leave the property clean, not cleaned. Please leave the apartment as clean as possible and leave all towels and bed linen, that have been used on the floor to be laundered. Linen. All sheets towels and bedding are provided, so there is no need to overfill your suitcase. The photographs do not do the apartment justice, it is very well equipped with everything you could need and it is very comfortable. The balcony patio area is much bigger than it appears and there is plenty of room to sunbathe. Evening meals taken on there, with the fantastic view are pleasure. I would recommend the use of a car as whilst the supermarket is on the entrance to the development it is at the top of a very steep hill. There are two allocated parking spaces in the secure car park in the basement to the building. More often than not we had the pool to ourselves and have to say it is a great place to stay. We had a super holiday (the whole family) with fun at the pool, beach and sightseeing locally and around in the area. 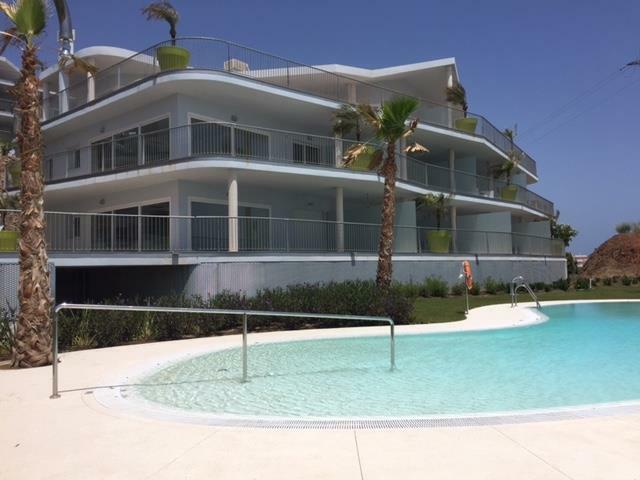 Super large apartment with a nice large terrace where you are able to sit in the shadow or in the sun, either enjoying the fantastic view over the sea or enjoy seeing the children playing at the pool. This is not the last time we will rent this apartment.